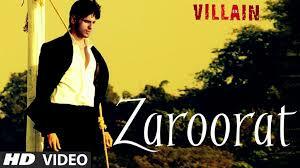 Presenting Zaroorat Video Song from the upcoming musical romantic thriller Ek Villain. It is set for release on June 27 2014. Well, well, the hangover of Galiyan and Banjara is not over yet and we have come across another gem from the album of Ek Villain which is titled Zaroorat. It is crooned by Mustafa Zahid who sung Bhula Dena from Aashiqui 2. The number is composed and written by Mithoon. The movie is directed by Mohit Suri (Director of blockbuster Aashiqui 2) and produced by Ekta Kapoor under the banner of Balaji Motion Pictures. Siddharth Malhotra as Guru, Shraddha Kapoor as Aisha and Riteish Deshmukh as Rakesh are the main leads in the film while Amrita Puri as Fatima, Remo Fernandes as Prahlad, Kamaal Rashid Khan, Aamna Shariff and Shaad Randhawa will appear in supporting roles. Give your verdict on Zaroorat Video Song. Stay tuned and be filmy for more Box Office Updates on Blog To Bollywoood.